The Autumn is my absolute favorite time of year because that means it’s apple picking season and if it was up to me we would go apple picking every single weekend until the apples are gone. In that case I would of course need some fabulous Apple Recipes, which is why I’ve put together this mother-load of Autumn Apple Recipes. So grab a bushel or a peck of apples and bake up something scrumptious! Thanks bunches for sharing my apple pecan pie cronuts! So many yummy treats to try!! Thank you so much for sharing my Spiced Apple-Peach Crisp!! I’m among lots of other yummy treats! Thanks bunches, actually, perhaps I should say bushels for sharing my apple cinnamon swirl bread! We just picked apples on Saturday, so this is perfect timing. I need to make a pie this week. Then I need to figure out how to make those donuts. I love apple cider donuts! Thank you so much for the feature <3 Lots of great recipes here!! 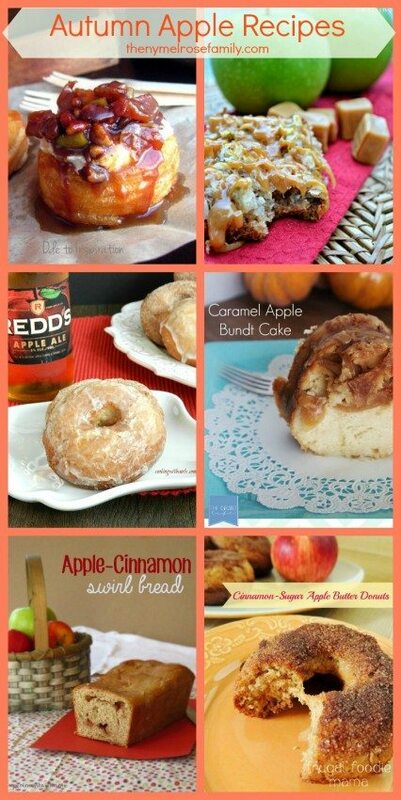 This is an insanely delicious collection of apple recipes! Yum!